Company Members receive a quarterly publication called The Military Collector & Historian (familiarly known as the Company Journal). The Journal is professional in content and is profusely illustrated. 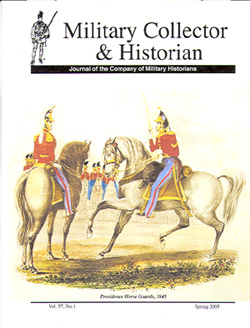 Its richly annotated articles cover such subjects as weapons, accoutrements, uniforms, materiel, and colors and standards. They also include information on military organization, unit history, military art and artists, recently published books and other publications, and the activities of the society and its members. Click here for more information. This series now numbers nearly 900 titles, and comprises the most extensive documentation ever undertaken of this subject. Representing the work of different member artists, these brilliantly colored prints illustrate military units from North and South America, and the units of any country that saw service in the Western Hemisphere. A documented descriptive text accompanies each plate. The plates are 11 x 14 inches in size, printed on high quality watercolor paper and are suitable for framing. Click here for more information. 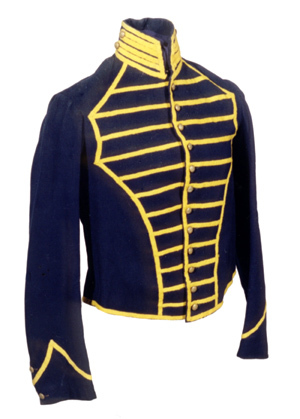 The Company has a collection of approximately 300 nineteenth century uniform items purchased by Mrs. Anne S. K. Brown in the early 1950s. The purchases were from two major private collections and the materials have the importance of having a known provenance for over a half century. Click here for more information. The Company Dispatch was the irregular newsletter of the Company. It contained books reviews and other information for Company Members. It is no longer published, but prior issues are still available. A comprehensive online index of both the Journal and MUIA plates is available here. To Advertise in a Company publication, click here. Publication Guidelines are available here for potential authors/artists.